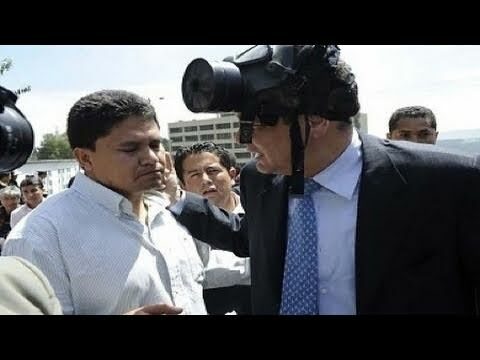 ON September 30, Rafael Correa was held by a group of angry policemen for about 10 hours creating a political scar in this Andean republic that would not be easily healed. In the days that followed the idea that there could have been a mastermind coordinating the actions of those who took such radical measures takes shape. There are reported facts that cannot been ignored: all the Colonel's men where very active that day, having secret meetings in hotels, speaking on TV and allegedly coordinating what was taking place in a number of scenarios. The Colonel himself was conveniently in Brazil; but it seems like fate has a weird way to put the Colonel's name in the last four Coups in Ecuador, even when he is not there. Who is behind all of this? Was this Lucio's coup? To best understand what took place that day, let us review some historical context in Latin American's revolts and regime changes. Oscar Leon reports for The Real News. Will Correa’s Party Survive Ecuador’s General Elections? OSCAR LEÓN, REPORTER AND FILMMAKER: September 30, 2010, Ecuador wake ups in shock. The police was holding a nationwide protest. Quito’s airport was also closed. There was chaos. President Correa goes to regimiento Quito to tries to negotiate with the armed policemen. There is a confrontation, and he ends up being held hostage for about ten hours. After the police rebellion on September 30, many pointed the finger at Colonel Lucio Gutiérrez. He was a strong ally to the establishment. This has raised the question of a foreign power involvement behind what took place on September 30. To get a better understanding about coups in Latin America, let’s review a little context. All the colonel’s men. According to historian [inaudible], between 1902 until 2002, 327 revolts overtaking power occurred in Latin America. Under the Monroe Doctrine, in South America 30 percent and in Central America 70 percent of those coups were under direct US intervention. Local right-wing factions normally sponsored the army to seize power by force. On only three of those occasions, popular militias successfully overthrew military-backed-up governments. In the ’90s, the foreign debts interest rate increased 300 percent under Paul Volcker’s Fed. This profoundly destroyed the middle class all across Latin American countries. The number of people falling into extreme poverty was just unimaginable. F. WILLIAM ENGDAHL, JOURNALIST AND HISTORIAN: What happens in 1979, David Rockefeller sends one of his trusted aides, named Paul Volcker, from New York City down to Washington to become the chairman of the Federal Reserve Board. Six months after Volcker comes into Washington, Volcker institutes the shock therapy, raising interest rates, through technical means that the Fed has, raising rates by 300 percent and more in a matter of weeks. And what happens in countries like Argentina, Brazil, and so forth, suddenly this very low interest rate dollar debt that they have explodes beyond the point of being payable. Even Mexico, which was an oil producer and exporter, was unable to pay its debts by 1982. LEÓN: As a result of this process, since ’99 and 2010, 13 countries have elected left-wing governments. In this new century, three of the most radical regime have suffered attempted coups. In each of those cases, popular support for the government have prevented these coups from success: Chavez’s Venezuela in 2002; Evo Morales’ Bolivia in 2006; Rafael Correa’s Ecuador in 2010. In Haiti, 2004, Jean Aristide was ousted out of power by direct military intervention. In Honduras in 2009, a successful coup forced José Manuel Zelaya out of office. On September 30, Rafael Correa was held by a group of angry policemen for about 10 hours, creating a political scar in this Andean republic that will not be easy to heal. In the days that follow, the idea that there could have been a mastermind coordinating the actions of those who took such radical measures takes shape. There are reported facts that cannot be ignored. Vice Chancellor Kintto Lucas shared with us the official version. KINTTO LUCAS, VICE CHANCELLOR OF ECUADOR (SUBTITLED TRANSLATION): I have no doubt, first, it was an attempted coup. That much is clear because of the way things happened, mainly because an armed institution arose against the governing power—more than just an uprising, it was a well-coordinated operation that included armed policemen, occupations of airports, and a plan to bring about chaos in many cities, in order to create a power vacuum, concluding in the eventual kidnapping of the president, according to different investigations. On 9/30 it was already evident that some factions were behind this. They were encouraging and talking not only to the protesters, the mobilized policemen, or the Air Force commandos who closed the airport; they were also trying to get the Army to join in. It’s important to know what happened a few days before. On September 23, a week before the attempted coup, there was a meeting in Miami at the Interamerican Institute for Democracy, a supposed conference by Lucio Gutiérrez. There was also Mario Pazmiño, former army intelligence chief during a number of years, especially under Lucio’s presidency. He is denounced to be linked with foreign intelligence agencies. It’s too much of a coincidence both men were there. There was also runaway banker Roberto Isaias involved in his bank’s bankruptcy and bailout—actually, the whole country almost went bankrupt because of him. Former president Gutiérrez does not need introduction. We all know him, and we all know as president he was a real democratic man. LEÓN: Cuban writer Carlos Montaner was far off the mark. Colonel Gutiérrez is not really a very democratic figure. He actually used to call himself a dictocrat—a mix of a democrat and a dictator. Come with me and take a look at one of the most interesting figures in Ecuador’s lost decade. Between 1996 and 2006, three popular revolts took down a president. Lucio Gutiérrez has somehow been present in all four coups, including the last one on September 30, 2010. On the first coup, he was protecting his mentor, Abdalá Bucaram, who was being ousted for widespread corruption. Lucio was the president bodyguard, helping defend the palace while Bucaram and his people flee, allegedly taking huge bags of cash, computers, and even some furniture from the presidential palace. A graduate from the Inter-American Defense College in Washington, on the second coup he played a key role and infiltrate and manipulate a massive indigenous revolt that had taken the capital by storm on January 21, 2000. Thanks to Lucio’s key operation, which kept Vice President Noboa as President Mahuat successor, the indigenous revolt was dealt with. And the country keep paying debt and keep being plundered by foreign corporations and banks. In 2005, he watched the third coup from a different tribune, this time as a president. He betrayal his left political allies, like CONAIE [Confederation of Indigenous Nationalities of Ecuador] and the grassroots socialist movement. In a clear outright abuse of executive power, he place by any means his people as judges and in the Supreme Court, to bring former corruption-indicted presidents and vice presidents back to the country. This and his subservience to the IMF, becoming the best debt payer in South America, as well as the US military base he allowed in Ecuadorian soil, got the people against him. Lucio literally had to run for his life. Some people invaded the airport to prevent him from boarding a plane. Actually, Lucio had to hide for days in the Brazilian Embassy before being smuggled out by plane to Brazil. Fast forward 2010. On September 29, the night before the police revolt, a meeting takes place in a Swiss hotel, where many of the Colonel’s men from Sociedad Patriótica, Lucio’s political party, and reportedly some other opposition leaders gathered until very late at night. (SUBTITLED): Mr. President: (that night) we were only eating sausage and fries! LEÓN: The next day, those very same men were reportedly in charge in each one of the fields where the riots took place. On the regimentio Quito hospital, former colonel Fidel Araujo, wearing a bulletproof vest, was in the front line speaking on the phone and giving TV interviews. (SUBTITLED): Are you going to remain in here? FIDEL ARAUJO, FMR. COLONEL (SUBTITLED TRANSLATION): Of course I will remain in here. ARAUJO: As a citizen. I will support (this men). ARAUJO: I was not there at the time in the regimiento Quito. I was taking care of my business. LEÓN: On the popular assembly, Lucio’s brother Gilmar was reportedly the man in charge [of] not allowing assembly to session, and not even letting the congressmen inside the building. Some of them were even assaulted. On the government’s TV building, Lucio’s former attorney and his brother, along with some other key figures, storm inside, breaking doors and pushing the guards and the station employees. LUCAS [SUBTITILED TRANSLATION]: We don’t believe the US government is behind this attempted coup. The US government had somehow said so, too, speaking clearly in defense of the democratic system in Ecuador, beyond our regime, in defense of Ecuador’s democratic process. We know neither President Obama or Secretary of State Clinton nor the US government had any hand in this. But there are power factions in USA that would be very interested that President Correa’s government fail and maybe even fall. LEÓN: Even if there seems to be no evidence of a direct US intervention, the US recognition to the new Honduran regime may have sent a message to the right-wing factions through Latin America: if you can successfully take powers from the left, eventually you can get recognition by the world powers. Maybe that’s what motivated the right-wing powers in Ecuador to try this attempted coup. The fact that in Ecuador’s history the military has only stepped in as a panic button to settle faction disputes may have been what allowed this Correa government to stay put, especially when compared with some others’ much more aggressive military, like those in Honduras. These factors might have prevented a possible coup and even a murder of the president to take place, yet the crimes that happened are beyond any imaginable scale. Not only physical damage was inflicted, but also the confidence and integrity of many institutions have been seriously affected. All the Colonel’s men were very active that day, having secret meetings in a hotel, speaking on TV, and allegedly coordinating what was taking place in a number of scenarios. The colonel himself was conveniently in Brazil at that time, but, ironically, his own daughter was among the soldiers that went under fire to rescue the president. It seems like fate has a weird way to put the colonel’s name in the last four coups in Ecuador, even when he’s not there. If these reported actions turn into further evidence and convictions, how high the investigation will go? Who is behind all of this? Was this Lucio’s coup? Maybe, just maybe time will tell. For The Real News, this is Oscar León.